Complete your sleep space with this elegant and lovely comforter set. The serene colors are met with a dazzling paisley pattern on a cotton face for durable use that retains its color year after year. Both sets boast grey, taupe, and white colors on your choice of a charcoal grey or grey-blue backgrounds. This is a really nice comforter set. True to color, and cozy. I would recommend getting g the king if you have a queen bed with a thick mattress, that way it will cover more. The full/queen barely covers the sides of our bed. Initially, I was hesitant to order this comforter. We received the coverlet as a gift and the colors did not look at all like they did online...baby blue, olive green, and a buttery yellow. We sent it back and ordered the comforter instead. The comforter is perfect! Much more subtle, muted colors, and it looks just like it does in the pictures. The comforter itself is great! It's very lightweight, but keeps you very warm. I love the Gracewood Hollow Rio comforter set. I ordered the California King to fit my thick queen mattress. I'm so glad I read the reviews ahead of ordering. The comforter looks beautiful and goes well with my decor. I would recommend this product. Wanted cotton, found this set. Was surprised by how wonderful it is. Super soft! Like sleeping on a cloud soft. Love it. Quality good. Very very happy. GREAT comforter! Just the right weight, softness, texture, and colors! 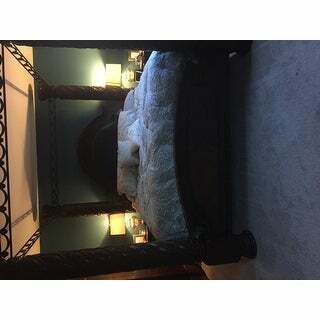 It fits our king sized bed perfectly and the paisley pattern really perks up the room. I highly recommend this product! I have a king size bed, no pillow top, not a thick mattress and this comforter is DEFINITY SMALL. It barely touches the head &amp; footboard and does not hang over the sides much. If it was a half inch smaller I probably would have returned it. If you have a queen bed, I definitely suggested getting a king size. However, it's incredibly soft and thick. Fluffed up nicely when washed. Beautiful pattern! The color says blue,grey The set is light blue and tan. Pretty muted colors, blends well with most decors. The colors are printed on the comforter so up close does not look "high end" but I love it. I really love this comforter. Very pleasing to the eye and very soft to touch. It covers all the way down to the bedframe on a pillow topper mattress and standard box spring. The throw pillows are attractive, not cheesy like some sets. Fabric quality is not cheap and stitching seems to be well done. The quilting is done in a more modern way with a more minimalist approach. I would highly recommend this, it's beautiful. 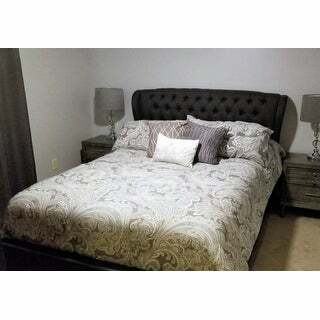 I absolutely love this comforter set!!! I was afraid it was going to be thinner and lighter than it actually is. It is actually perfect. The color was a bit different than what the picture is. The tan in parts looks more gray online, so I ordered a bed skirt that did not match. The colors are still great however! Great value, love the colors! A little less vibrant than the picture but has a great beach vibe, which is what I wanted. Love the color combination and pattern...Well made. I was skeptical about purchasing bedding online. I like to touch and feel things before I buy. There is nothing worse than hard-feeling, itchy bedding when you want a good night sleep. This is a great quality set, soft to the touch and keeps me warm enough. I bought this set for a Murphy bed in our guest room. The duve covert is soft and has ties on the end which are a nice feature for keeping the down comforter in place. The light blue and sand colors are sete and the set looks beautiful! Very soft and lightweight. It keep you warm without weighing you down. The colors are beautiful and the comforter is well made. Looks great in my spare bedroom! Would definitely recommend this set. Beautiful colors and exactly what we needed! Purchased this for a spare room makeover along with a bed, nightstands and lamps....all from OS. It is hard to shop without seeing colors in person and it took me a while to decide. I wanted something that was both feminine and masculine since this was for a guest bedroom. This fit the bill and the quality is wonderful. This really pulled the room together and now I just need to order art for the walls. Thanks OS! Love this comforter set. Great price for al that comes with it. "Does the gray color option have any blue in it/"
Yes, a little bit of dusty blue, a little bit of very pale maise yellow & some taupe. Very versatile & wall color or accessories would make any of these minor colors pop. "What is the second color in the blue option? Is it a light brown, or is it gray?" There is brown and gray. I would describe it as "taupe" leaning more toward gray. "Is the actual color blue or aqua in the comforter/"
The comforter is a light greyish blue. "It states that this comforter is 100% cotton including the filling but above one of the customer reviews states that it is a polyester filling. Which is true?" "Is this an aqua blue or gray blue?" The comforter I ordered is in grey and beige tones, not the blue one. I really like the pattern, colors, and weight of this comforter! I gave this set to my daughter and she just said its like a grayish blue. Hope that helps. She really likes it and it is a beautiful set. "Is this a comforter or a duvet cover?" "is the blue print have brown, tan and white?" Hello emily jones, we try to represent the colors of our products accurately. Unfortunately, due to the difference in monitor colors we cannot guarantee that the color will match exactly what you see on your screen. Yes, it does. Thank you for shopping with us.